It is with great sadness that UNPO has received the news about Linnart Mäll, the first UNPO President, passing away. Mr. Mäll was one of the founding fathers of UNPO, and highly regarded both in his native Estonia and abroad. He was highly esteemed by his UNPO colleagues. 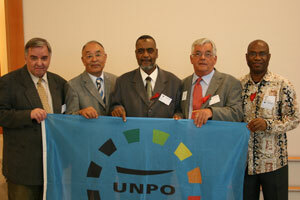 Linnart Mäll (left) together with his successors as UNPO President, Erkin Alptekin, Seif Sharif Hamad, Göran Hansson and Ledum Mitee at the UNPO General Assembly 2008. UNPO General Secretary Marino Busdachin on behalf of all UNPO members pays his deepest respect to Linnart Mäll and mourns the UNPO founder. Mr. Busdachin expresses his cordial condolences to Mr. Mäll’s family. Mr. Mäll was dedicated towards the objectives of UNPO - he was a convinced defender of democracy and freedom and as he truly believed in non-violence, he had a profound knowledge of the writings of Mahatma Gandhi. The loss of Mr. Mäll, a great man and a great Estonian, has also been noted by the President of Estonia, Toomas Ilves and by former UNPO chairperson Erkin Alptekin. Famed Estonian historian, orientalist, translator, scholar and politician. Born in Tallinn, Estonia, Dr. Mäll graduated from the Tartu State University in 1962 with a degree in general history. He followed graduation with postgraduate studies at the Institute for Oriental Studies at the Academy of Sciences of USSR (1964-1966) and Department of History, Tartu State University (1966-1969) before finally completing his PhD in 1985. Within this field Mäll was an innovator, and the first to apply the methods of semiotic analysis when investigating Buddhist texts and general Oriental thoughts and literature. His progressive ideas made him one of the central figures of oriental studies within the Moscow school of semiotics in the 1960’s and 1970’s. During this time (specifically 1969- 1973) he served as a lecturer at Tartu State University, before being dismissed for anti-communist sentiments. Later he worked for ten years as an engineer of the Cabinet for Oriental Studies. After this highly successful tenure Mäll was partially rehabilitated in the academic world and was promoted to the head of the Laboratory for History and Semiotics (1983-1991). Continuing on his interest in small nations and peoples, in 1991 Mäll was a founding member and first Chairman of the UNPO, as a member of the Estonian Congress and Estonian Council, 1990-1992, in an attempt to fortify plans to break away from USSR control. He retained this position until 1993, when he became Assistant General Secretary for Eastern Europe, and began a decade long tenure as Director of the UNPO Co-ordination Office in Tartu, Estonia. During this time Mäll was pivotal for UNPO in Eastern Europe and contributed to the co-ordination and planning of events for over ten years. These events included The Third Regional Conference for Eastern Europe that addressed issues of economic and political co-operation in a regional context and the process of de-Sovietisation amongst many others. Concurrently, In the 1990s Mäll worked on the elaboration of the conception of humanistic base texts. Since 1994 he has been the Head of the Centre for Oriental Studies, at the University of Tartu. He later served as head of the Laboratory for Oriental Studies (1991-1994). In 1998 he expanded his work on humanistic based texts and he was the initiator and head of the research project "Humanistic base texts in the history of mankind". Mäll was also an author of ten books and over one hundred academic articles on the subject. Mäll passed away Sunday, 14th February after suffering from a long battle with cancer. Linnart Mäll (in the background) with Dalai Lama during his visit to Estonia in 1991.